Abstract. 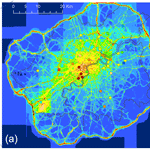 A coupled regional-to-local modelling system comprising a regional chemistry–climate model with 5km horizontal resolution (EMEP4UK) and an urban dispersion and chemistry model with explicit road source emissions (ADMS-Urban) has been used to simulate air quality in 2012 across London. The study makes use of emission factors for NOx and NO2 and non-exhaust emission rates of PM10 and PM2.5 which have been adjusted compared to standard factors to reflect real-world emissions, with increases in total emissions of around 30% for these species. The performance of the coupled model and each of the two component models is assessed against measurements from background and near-road sites in London using a range of metrics concerning annual averages, high hourly average concentrations and diurnal cycles. The regional model shows good performance compared to measurements for background sites for these metrics, but under-predicts concentrations of all pollutants except O3 at near-road sites due to the low resolution of input emissions and calculations. The coupled model shows good performance at both background and near-road sites, which is broadly comparable with that of the urban model that uses measured concentrations as regional background, except for PM2.5 where the under-prediction of the regional model causes the coupled model to also under-predict concentrations. Using the coupled model, it is estimated that 13% of the area of London exceeded the EU limit value of 40µgm−3 for annual average NO2 in 2012, whilst areas of exceedances of the annual average limit values of 40 and 25µgm−3 for PM10 and PM2.5 respectively were negligible. How to cite: Hood, C., MacKenzie, I., Stocker, J., Johnson, K., Carruthers, D., Vieno, M., and Doherty, R.: Air quality simulations for London using a coupled regional-to-local modelling system, Atmos. Chem. Phys., 18, 11221-11245, https://doi.org/10.5194/acp-18-11221-2018, 2018. A coupled atmospheric dispersion modelling system has been developed, comprising a regional chemical transport model and a street-scale urban dispersion model. It was applied in London for 2012 and for all common regulated air quality pollutants, with evaluation against measurements. The modelling demonstrates the interaction between local and regional scales, which differs between pollutants. Real-world estimates of emissions have been used to adjust standard factors and improve model results.